The release in early December of the CoreLogic November hedonic home value index results confirmed that national dwelling values slipped by 0.7% over the month, led by Sydney where the drop was double the national average. Headlining the November results, the CoreLogic hedonic home value index recorded its weakest month-on-month change in dwelling values since the Global Financial Crisis; national dwelling values slipped 0.7% lower in November, led by larger falls in Sydney (-1.4%) and Melbourne (-1.0%) where the pace of decline has accelerated over the past month. Nationally, dwelling values are down 4.2% since peaking in October 2017, with dwelling values retracing back to levels last seen in December 2016. 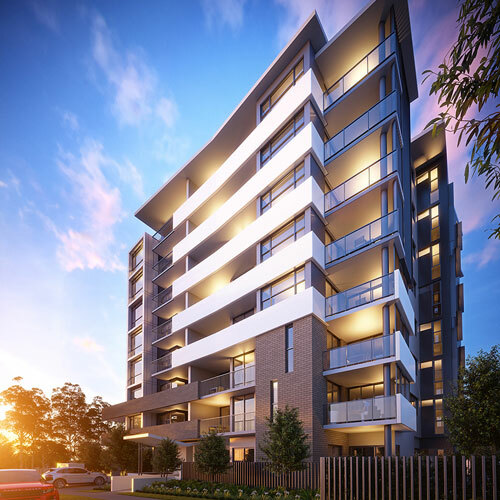 Commenting on the results, CoreLogic head of research Tim Lawless said, “The downwards pressure on national dwelling values is largely confined to Sydney and Melbourne which together, comprise approximately 55% of the value of Australia’s housing asset class,” he said. Since peaking in July 2017, Sydney’s housing market is down 9.5% which is on track to eclipse the previous record peak-to-trough decline set during the last recession when values fell 9.6% between 1989 and 1991. 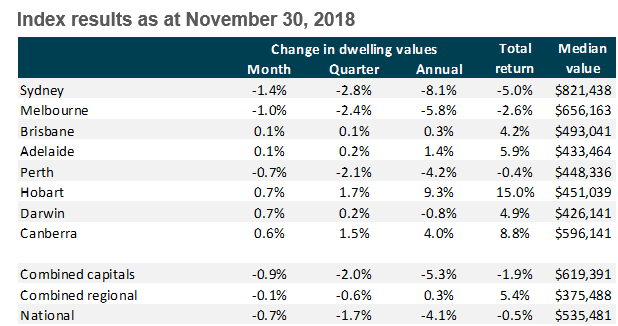 Melbourne dwelling values peaked four months later than Sydney, in November 2017, and have since fallen by 5.8% through to the end of November 2018. Although the weaker housing market conditions in Sydney and Melbourne are under the spotlight, Tim Lawless said, “Conditions across the Australian housing market are increasingly diverse. Dwelling values are trending higher across five of the eight capital cities, albeit at a relatively slow pace compared with the previous surge in Sydney and Melbourne. Hobart and regional Tasmania continue to be the standouts for capital gain, with values up 1.7% across both regions over the past three months”. Tim Lawless points towards several factors that are influencing the downwards trend in Sydney and Melbourne, while other regions continue to see some level of growth. The tightening in finance conditions has been more pronounced across the investor segment of the market, where Sydney and Melbourne have recorded much higher concentrations of investment demand.